The Precious Moments’ Chapel is near my sister’s home in Joplin, Missouri. It’s back up the interstate toward St. Louis and then a bit up the interstate going west near Carthage. Now, I want to go back every time we go. Last week, I showed you the bottom of the painting by Precious Moments’ creator Samuel J. Butcher. Today, you can see the whole wall behind the front of the chapel. As the guide points out, Christ is in the center of the painting. It wasn’t planned by Butcher. It just turned out that way. 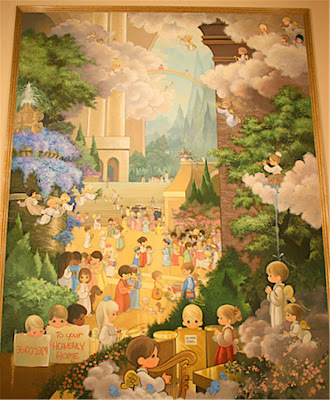 Click to enlarge the mural.